In the presence of nearly 200 guests, the new Structure, Symmetry, and Stability of Matter and Anti-matter research building was recently inaugurated on the campus of Johannes Gutenberg University Mainz. It will house the work groups of the Helmholtz Institute Mainz (HIM). The facility offers a modern and well-equipped environment for longer-term, outstanding research projects in the fields of physics and chemistry. HIM was established in 2009 as the first Helmholtz Institute in Germany. Its purpose was to promote long-term collaboration between the GSI Helmholtz Center for Heavy Ion Research in Darmstadt and Johannes Gutenberg University Mainz (JGU). Now the close proximity of the participating research groups in the new building will provide an atmosphere in which innovative ideas and productive joint projects will thrive. The research building was constructed as the result of a recommendation made by the German Council of Science and Humanities back in 2011. The Estate and Construction Management Agency of Rhineland-Palatinate (Landesbetrieb Liegenschafts- und Baubetreuung, LBB) erected the new building on the Mainz University campus the immediate vicinity of the Institutes of Physics, Nuclear Physics, and Nuclear Chemistry. Construction work began in December 2013 and the building was completed in the summer of 2016. Today, large parts of the building are already staffed and in use. The reinforced concrete solid building consists of a four-story office section, a two-story laboratory section, and a single-story experimental hall with a room height of up to ten meters. The main usable floor area of 3,600 square meters accommodates research facilities, offices, and workshop space for a total of up to 170 personnel. The scientific and technical equipment available includes large-scale devices, such as a high-performance computer. The costs for the new building and the technical equipment amount to about EUR 35 million in total and were jointly financed by the German Federal Government and the State of Rhineland-Palatinate. The Rhineland-Palatinate State Secretary in the Ministry of Science, Further Education, and Culture, Professor Salvatore Barbaro, said: "The foundation of the nationwide first Helmholtz Institute in Mainz represented and continues to represent a major success for Rhineland-Palatinate within the context of transregional research funding. From 2008 to 2016, the state of Rhineland-Palatinate provided EUR 160 million through the Rhineland-Palatinate Research Initiative. Due to the strategic focus of our research policy towards the promotion of profile-enhancing research areas we have managed to achieve long-term improvements in the underlying conditions for cutting-edge research and the promotion of young academics. 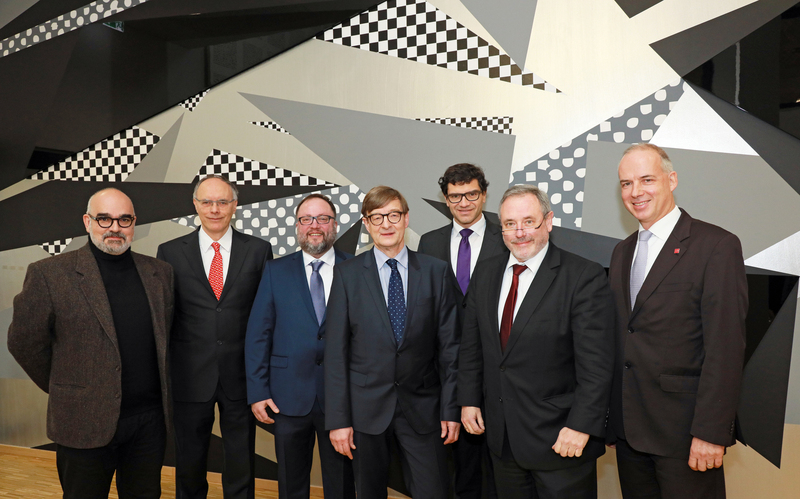 We plan to make further funding available to support the universities in Rhineland-Palatinate in the coming Excellence Strategy competition." "Helmholtz institutes are an excellent means of building strong partnerships with universities for permanent close co-operation in specific areas of research relevant to the future. They form the basis for intensive and prolonged collaboration," stated Professor Otmar D. Wiestler, President of the Helmholtz Association. "The Helmholtz Institute Mainz on the Gutenberg Campus is a first-class example of this. With its outstanding research achievements, it also demonstrates that Helmholtz institutes can be a very productive way of sustainably promoting Germany as major science hub." The scientists based at the Helmholtz Institute Mainz work in the fields of nuclear, particle, atomic, and accelerator physics. They are tackling fundamental questions relating to the structure, symmetry, and stability of matter and anti-matter. In particular, they are trying to arrive at a better understanding of the strong interaction, one of the four fundamental forces of physics. Another important research area is the development of accelerator systems and detectors for experiments at the GSI Helmholtz Center for Heavy Ion Research in Darmstadt and at the FAIR accelerator system being developed there. It is hoped that on completion, FAIR, one of the largest research projects for fundamental research anywhere in the world, will allow new insights into the structure of matter and the evolution of the universe. "HIM combines the specific areas of expertise of the university and GSI in the best possible way. The research and technical development projects pursued at HIM are extremely valuable for the scientific programs both at GSI and the FAIR international accelerator system. The new facility and its innovative research infrastructure will significantly contribute towards this highly-promising area of collaboration," added Professor Paolo Giubellino, Scientific Director of the GSI Helmholtz Center for Heavy Ion Research. "Mainz University offers outstanding conditions for the scientists at HIM, who have access to an excellent research environment here in the fields of physics and chemistry—with the MAMI electron accelerator, the TRIGA research reactor, and MESA, the planned new linear accelerator," explained the President of Johannes Gutenberg University Mainz, Professor Georg Krausch. JGU contributes technical infrastructure as well as research and technical staff together with overheads funding to help with the running of HIM. "After all the planning, construction, and commissioning, we are now very much looking forward to get research started in our new research building, which is the result of a national initiative competition. The close proximity, the technical installations, and the various laboratories will better enable us to stay ahead in the race when it comes to producing research that is both high-profile and top-class in the international context and thus appropriately prepare the next generation to take up the baton. We are grateful for these opportunities and will treat it as an incentive to continue to do our best," said the Director of the Helmholtz Institute Mainz (HIM), Professor Frank Maas. Markus Rank, head of the Mainz office of the Estate and Construction Management Agency of Rhineland-Palatinate (Landesbetrieb LBB), thanked the construction representatives of the Helmholtz Institute and the university for their close cooperation: "The result is a building which is a kind of tailor-made facility for science, providing a perfect fit with the needs of top-class research for many years to come." The artist responsible for the artwork in the foyer of the building is Mario Hergueta from Nauheim. He has decorated the walls of the entrance hall, which reach right up to the top floor, with geometric shapes in black, gray, white, and reflective silver-colored metal. Hergueta had come out on top against six other contenders for the commission in the restricted phase of a competition initiated by the Rhineland-Palatinate Ministry of Finance that followed an open tender process.